Halbach array: What is it and how is it used in electric motors? You are here: Home / FAQs + basics / What is a Halbach array and how is it used in electric motors? What is a Halbach array and how is it used in electric motors? A Halbach array is arrangement of permanent magnets that creates a stronger field on one side while reducing the field on the other side to near zero. This is accomplished by orienting the magnets so that their poles are out of phase, typically by 90 degrees. This orientation essentially re-routes the magnetic field below the structure (the “non-working” surface) to the plane above the structure (the “working” surface), strengthening the magnetic field of the working surface and reducing the field of the non-working surface to nearly zero. In a normal magnet (left) the field strength is equal on the top and bottom of the magnet. In a Halbach array (right), the field strength is concentrated on the top side, with a very weak field on the bottom. The effect of rotating permanent magnets to create a strong field on one side and a virtually zero field on the other is sometimes referred to as “one-sided flux,” and was considered a curiosity by its discoverer, John Mallinson, in the 1970’s. But in the 1980’s, Klaus Halbach of Berkeley Labs rediscovered this phenomenon and created what are now known as Halbach arrays, using them to focus and steer the beams in particle accelerators. In addition to linear, or planar, configurations, Halbach arrays can also be configured in circular, or cylindrical, arrangements, with the magnetic field concentrated at either the outer diameter or the inner diameter. An electric motor can be constructed using a cylindrical Halbach array, with the magnetic field directed inside the cylinder and windings inserted into the field. The Halbach array can either be stationary, with the windings rotating, or the Halbach array can serve as the rotating element, with the windings stationary. In the latter configuration – sometimes referred to as an “inside out” design, the stator windings would be electrically commutated, and the motor could be operated as a brushless DC (BLDC motor) or as a brushless AC (BLAC) motor (also referred to as a permanent magnet synchronous motor, or PMSM). A Halbach cylinder can be used in an electric motor, as in this example, with the magnetic field concentrated at the inner diameter and the Halbach array rotating around the windings. Although not yet mainstream, electric motors based on the Halbach array offer measurable benefits over conventional designs, including high power density and high efficiency. One of the enablers of these benefits is that a Halbach array motor does not require laminations or back iron, so the motor is essentially ironless. This significantly reduces eddy current losses and hysteresis losses – often referred to as “iron losses” or “core losses.” Eddy currents, and therefore eddy current losses, do, however remain in the windings, due to the relative motion between the windings and the magnetic field. These can be reduced by using a type of wire, referred to as “Litz wire.” The elimination of back iron or laminations also reduces weight and inertia, allowing the motor to start and stop faster and to reach higher top speeds (10,000 rpm or greater) for highly dynamic applications. Litz wire consists of individually insulated strands that are braided or woven together in a manner that minimizes losses. The primary downside to Halbach array motors is cost – specifically, the cost of manufacturing the Halbach array. Because the magnets are arranged with each one repelling its neighbor, the processes of assembling the magnets and ensuring the adhesive or fixing method is sufficient is relatively labor-intensive. 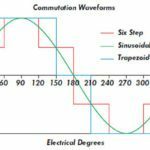 Hysteresis loss and eddy current loss: What’s the difference?